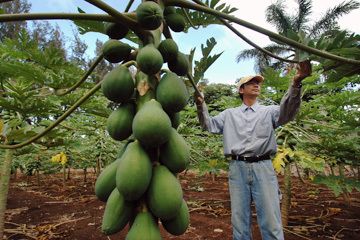 Papaya farmer Albert Kung checks newly formed fruit on a genetically engineered papaya tree at Kamiya Farm in Laie. LAIE » Genetic engineering saved Ken Kamiya's papaya farm on Oahu's north shore, and it may yet rescue the orchid from the grips of a nasty flower-killing virus. But in Kona, Una Greenaway lives in dread that biotechnology will ruin her organic coffee plantation. So it goes in the Aloha State, where genetic engineering has riven a state just now awakening to the fact that balmy and remote Hawaii has -- for better and worse -- long served as the world's largest outdoor biotechnology lab. Since scientists first planted the spectacular commercial flop that was the Flavr Savr tomato on a small plot here in 1988, federal regulators have approved more than 10,600 applications to grow experimental biotech crops on 49,300 separate fields throughout the United States. More of these are in Hawaii than any other state. Through the powers of biotechnology, low-nicotine tobacco, disease-resistant cotton and soy immune to weed killer are grown here. Hawaii's genetically engineered corn projects outnumber even those grown in Iowa and Illinois. Biotechnology companies say the weather affords them a year-round growing season, while anti-industry activists say the five-hour plane ride from California gives the "gene jockeys" remoteness from prying eyes. Whatever the reason, farmers such as Kamiya are satisfied with genetic engineering's effects on Hawaii. Kamiya has grown papayas, Hawaii's best-selling fruit behind pineapple, since he got back from serving in the Vietnam War in 1969. He lived through three crop-killing epidemics and the vagaries of farming, but by the early 1990s his farm, along with the entire Hawaiian papaya industry, was finally on the brink of destruction. They were at the mercy of a cureless virus. For better and worse, Hawaii has long served as the world's largest outdoor biotechnology lab. Papaya farmer Albert Kung checks the leaves on a genetically engineered papaya tree at Kamiya Farm in Laie. 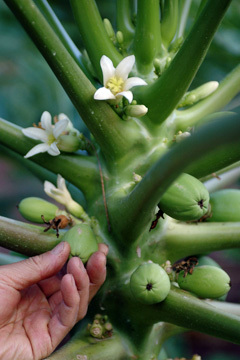 Scientist Dennis Gonsalves, a native Hawaiian then at Cornell University, developed the clever idea to genetically splice a harmless piece of the virus into papaya trees -- essentially vaccinating them in much the same way people fight the flu. The gambit worked, and today, the virus is a mere nuisance for the $16 million industry -- even for the 50 percent of papayas grown conventionally and without virus protection in Hawaii. That's because the virus has fewer places to roost now. "Gonsalves saved our butts," Kamiya said as he wandered among the mini-palm trees bearing ripe yellow fruit on the 15-acre farm he leases from Brigham Young University, which has a campus in Laie. The day before, Kamiya spent five hours in Honolulu at a meeting helping to defeat a proposed measure from qualifying for the ballot that would have banned genetic engineering on Oahu island and effectively put him out of business. But that's precisely what Hawaiian organic coffee growers like Greenaway and others want. They're shocked Hawaii has become biotechnology's chief laboratory and are concerned about their economic future. Greenaway worries that the creeping march of biotechnology in Hawaii will soon spell her financial ruin if consumers fear famed Kona coffee was somehow tainted by biotechnology. Researchers in the state are attempting to genetically engineer coffee plants to grow decaffeinated beans, which don't occur naturally. The researchers haven't yet grown their experimental coffee plants outdoors, even though federal regulators gave permission in 1999.